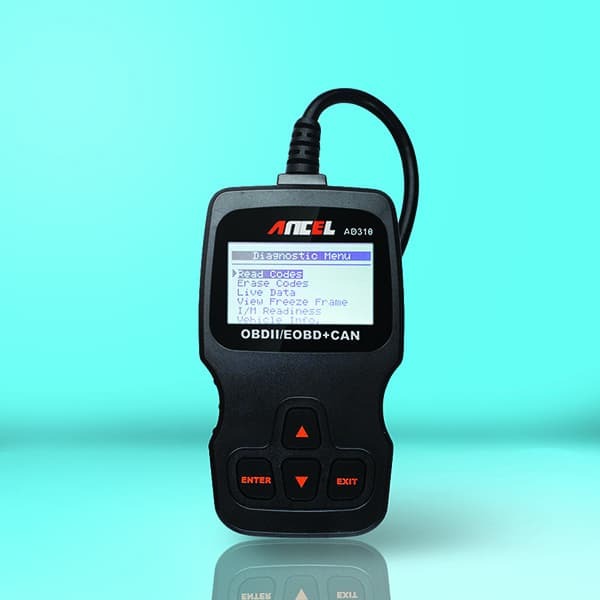 This is a small, stand-alone reader that is able to run a scan on your vehicle in order to find any problems. Upon finding problems, it's able to display codes to help you with getting the right remedy for just about any problem with your car. Furthermore, it's a great way to save money over getting your car checked out when there may just be a small issue. ​This device is extremely small. The top half is taken up by the screen, which is simple and monochromatic, and the bottom half has the buttons. The small screen is clear to read due to the simplicity and lack of color, but it is not tailored to looking at detailed information, especially in graphical form. The buttons are uncluttered. With only four buttons, there are less than many rival devices, making this an easier and more intuitive scanner to use. ​The scanner is connected to your vehicle by a short cable which is permanently attached to the device. This cable is also what brings power to the scanner. You get all of the basic functionality that you would expect with a vehicle scanner along with some more advanced features. You can check the history codes, pending codes, memory data, code definitions, and much more. This device will turn off your vehicle system to bypass the control, and find out what is causing the “check engine” light. Once it finds the problem, it is able to clear the code for you. It can also reset the monitors. Sometimes the “check engine” light and other warning lights are caused by the system itself and faulty monitors. This device can fix those problems without you having to lift a finger. You can get real-time data as you are running your diagnostic check. You have access to freeze-frame information, I/M readiness, and vehicle information. 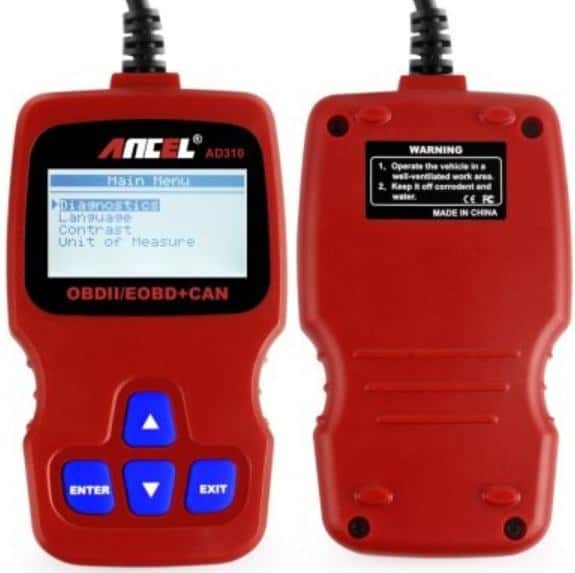 ​The scanner is compatible with CAN, OBD1, and OBD2 protocols. The screen may be small, but this is an intentional design choice. A small screen means that you cannot display a lot of data, so only the data which you need is displayed. 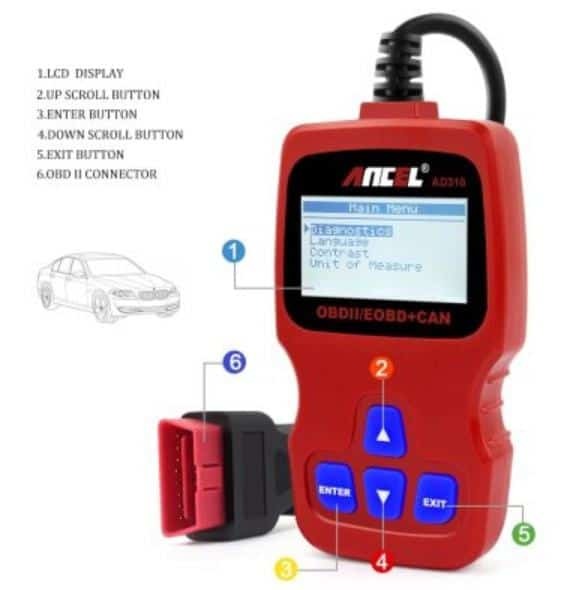 This helps to cut out all of the extra data which does not actually help you to diagnose and fix your vehicle. You get a clear code to diagnose the problem, and you also get some text to explain what the code means. By using plain language, this is a scanner which is easily usable by everyone. Having only four buttons means that this device is intuitive to use even without an instruction manual. The four operations, enter, exit, up, and down, are easy to use on every screen of the device. It is hard to go wrong with either the navigation or in making choices, making it a very handy tool for beginners. When you first use the device, it will also walk you through the menus so that you can get to grasps with the basic functionality. When you diagnose your vehicle, not only will you get the code, but you will also get some text detailing what this code means. Along with that, the device will tell you how serious the problem is. For instance, if you have an oil leak, then the device will tell you if it is a large leak or a small leak. ​The device also allows you to erase codes temporarily. This is beneficial if the problem is not a serious one. You save money in diagnosing your vehicle, and you do not have to pay someone to do it. You can also reset the warning light so that it will come back on if there is another problem. This is a basic code reader, so do not expect to get a lot of complicated information. The main benefit you are going to get from this is reading and resetting the “check engine” light codes. This device is not as accurate as rival models on the market. Most of the reads will be accurate, but it is recommended that you check twice to make sure that the reading is correct or you may try to fix the wrong problem. This is not a device for a professional mechanic. Where this unit shines is for monitoring the “check engine” light. It is perfect for diagnosis problems and saving you some money in the process. You can delay fixing issues which do not need an immediate fix, and you can fix some problems using this device alone. If you want to carry something around with you that you can use to save yourself some money in a pinch, then this is the device for you.